In an age when bacteria are becoming increasingly resistant to our best antibiotics and the words “E. coli” can shut down your favorite local Chipotle, people are desperate for anything that promises to wipe out germs. Unfortunately, when it comes to cleaning products that label themselves “antimicrobial,” they’re largely a pile of overpriced trash. Not only do they not work better than soap and water, but there’s growing evidence that they might make bacteria even harder to kill, by speeding along antibiotic resistance. Indeed, because of bacteria’s uncanny ability to adapt to the most inhospitable environments, scientists have been searching for creative ways to get past their defenses. One way, a new study in the journal ACS Biomaterials Science & Engineering suggests, might be to create a surface that keeps bacteria away from it in the first place. The researchers, hailing from Georgia Tech, created a form of stainless steel riddled with sharp bumps so tiny they can repel and kill bacteria, making the surface practically uninhabitable. Testing their creation, known as nanotextured steel, in the lab, they found it was able to bounce off both the gram-positive Staphylococcus aureus and the gram-negative Escherichia coli, two bacteria with lots of harmful and drug-resistant strains, for at least 48 hours. That’s important because gram-negative bacteria already have a unique cell membrane that makes them especially impervious to antibiotics. Equally important was that the nanospikes were too small to affect mouse cells placed on the steel, likely meaning the material could be used safely to coat devices that need constant contact with human cells, like surgical implants. “This surface treatment has potentially broad-ranging implications because stainless steel is so widely used and so many of the applications could benefit,” Julie Champion, an associate professor in Georgia Tech’s School of Chemical and Biomolecular Engineering, said in a statement. 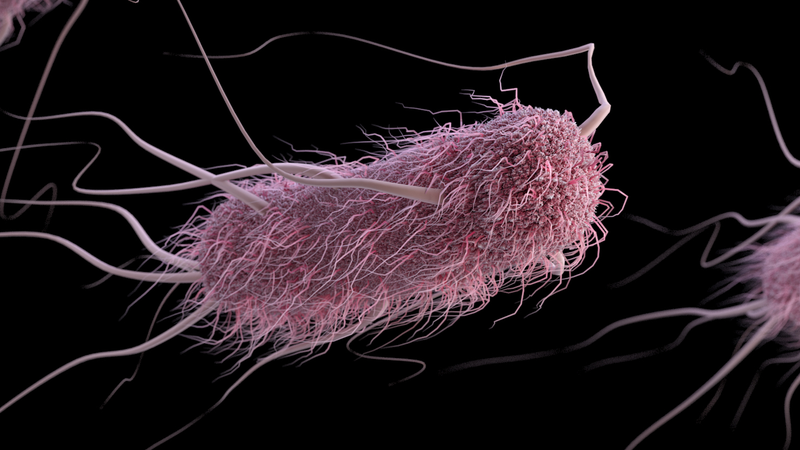 Aside from medical implants, stainless steel is used to coat food processing equipment, which can be a common source of outbreaks of deadly baddies like E. coli. Champion and her colleagues were trying to find a way to better waterproof steel, but were stymied by the fact that they would have had to rely on a chemical coating, a temporary solution at best. Eventually they turned to nature for inspiration, in particular the cicada insect, whose wings are able to kill bacteria because of how they’re structured at the nano level. The wings have protrusions that puncture the outer surface of bacteria that try to land on it, making them the natural version of those annoying spikes increasingly seen outside public-facing property (+1 to Mother Nature for not using them to get rid of homeless people). That’s likely how the nanotextured steel is pulling off its keep-away trick, but more research needs to be done to confirm that. According to the researchers, the process used to nanotexture steel, called electrochemical etching, is both relatively cheap, accessible, and leaves the steel unchanged to the untrained eye. “[You] cannot tell the tactile difference between untreated and nanotextured stainless steel surfaces by hand because the nanotextures are relatively too small,” study author Won Tae Choi told me in an email. Creating the steel involves changing the amount of current and voltage used in the electrochemical etching process, which means it should be easy to scale up the production of nanotextured steel if the team’s research continues to pay off, Choi said. For now, in addition to learning how to scale the process, the team plans to make sure the steel can permanently repel bacteria as well as test it in practical settings. Choi’s team aren’t the only ones who see the potential of nanotextured materials, either. Scientists elsewhere have done research showing nanotexturing could help sensor devices better detect diseases, and at least one biomedical company claims its nanotextured spine implants are easier for the body to tolerate.